Dr. David Teplin is an adult clinical psychologist with a private practice in Toronto, Canada. His primary focus is adult ADHD and substance use disorders. David is also part of the task force that The Canadian Psychological Association started to look at the psychological issues potentially related to the legalization of marijuana in Canada. In this conversation, you will hear David talk about addiction and ADHD. David shares some statistics on the relationship between ADHD and substance abuse disorders. There is overlap because there are factors that lend themselves to both conditions. All substances can mimic ADHD symptoms. A good part of this discussion is on marijuana, as medicinal and recreational use is becoming legal in many places. David speaks on this topic as both a citizen and a clinician. David discusses why individuals with ADHD may be attracted to marijuana and he lists some pitfalls of marijuana use for individuals with ADHD. Later in the episode, he also talks about treatment. [08:47] – David lays some of the groundwork for this discussion. ADHD is a risk-factor for developing possible issues around alcohol, drugs, and other forms of addiction. He shares some statistics on the relationship between ADHD and substance use disorders. [12:11] – ADHD oftentimes isn’t a condition that often exists by itself. [14:47] – David talks about the legalization of marijuana, both as a citizen and as a clinician. [19:21] – David talks about marijuana addiction and discusses if the addiction numbers will rise with legalization. [23:52] – David believes we need to investigate why individuals with ADHD are attracted to marijuana. [28:33] – David describes some of the pitfalls of marijuana use for individuals with ADHD. [29:33] – We talk about “the gateway drug” theory. The evidence on this theory is not as strong as it used to be. [32:28] – David explains what his responsibility as a clinician. [34:32] – David describes the measures he relies on, like the CAGE questionnaire. [38:43] – David clarifies something he said earlier in the episode. He talks about how the continuous usage of substances can “flood” dopamine and that can have negative impacts on the brain. [40:50] – David talks about the need for clinicians to acknowledge what the patient is saying without being judgemental. [46:13] – We talk about the rationalization and intellectualization of addictions. [50:08] – David encourages his patients to read. He suggests PubMed to discover peer-reviewed journals. He also warns against looking at forums. 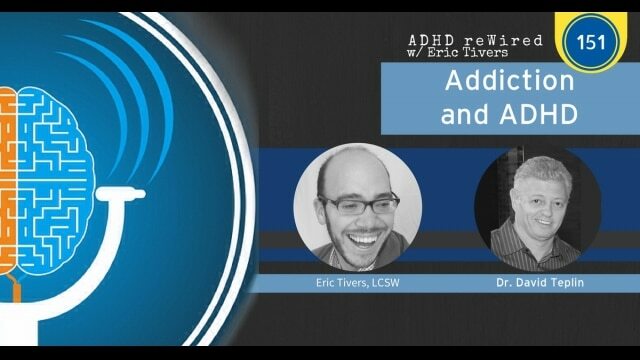 [52:00] – David talks about treatment needs of individuals with ADHD. [57:43] – David shares his opinions on the idea that the nature of addiction is that it’s a chronic condition. [1:01:42] – David explains how he determines which condition, ADHD or substance addiction, he treats first. [1:05:55] – David addresses the question that some parents have about medication in adolescents leading to substance abuse later in life.